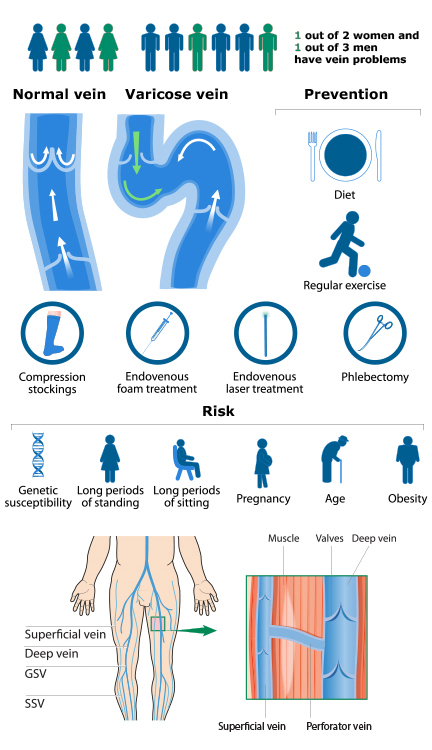 The vein clinic explains, what are varicose veins? Varicose veins are dilated, ugly, lumpy veins seen on the legs, arising from the superficial (surface) leg veins. Many people suffer with them and they affect men and women equally. We used to think that they run in families, but the latest research suggests that they are just very common! Arteries transport blood from the heart to the rest of the body. Blood then flows through microscopic blood vessels called capillaries, allowing oxygenation and nutrition to the surrounding tissues. Blood then travels back to the heart via veins. Our leg veins, therefore, have to transport blood uphill against gravity when we are standing upright. They achieve this because when we walk, the calf muscles contract and help to pump the blood up the leg. When standing still, blood is prevented from flowing back down the leg by one-way valves. The deep veins (deep venous system) of the legs do most of the work and their valves last most people a lifetime. Valves protecting the surface veins (superficial venous system) seem to be less reliable. They frequently stop functioning properly and we call them incompetent. Incompetent valves mean that blood does not flow up the vein as efficiently as it should and may actually flow down the vein, (venous reflux). This causes the pressure within the vein to increase, which then dilate and become varicose. The numerous superficial veins of the leg mainly feed into 3 vein ‘main roads’ (truncal veins), which then take the blood into the deep veins and then back to the heart. It is valve incompetence and venous reflux in these truncal veins that causes the feeding veins (tributaries) to become varicose. The Great Saphenous Vein (GSV, previously called the Long Saphenous Vein) begins on the inside of the ankle, travels up the inside of the calf and thigh and ends by joining the deep venous system (the femoral vein) in the groin at the Sapheno-Femoral Junction (SFJ). Varicose tributaries occurring due to GSV reflux typically appear on the inside (medial aspect) of the thigh and calf. The Small Saphenous Vein (SSV, previously called the Short Saphenous Vein) runs up the back of the calf and joins the deep (popliteal) vein behind the knee at the Sapheno-Popliteal Junction (SPJ). SSV Varicose veins are usually seen on the back of the calf. The Anterior Accessory Saphenous Vein (AASV, previously called the Anterior Thigh Vein) arises in the mid-thigh and runs up the front of the thigh to join the femoral vein at the Sapheno-Femoral junction in the groin. AASV varicosities are seen on the outside (lateral aspect) of the upper calf, the outside of the lower thigh and the front of the upper thigh. The superficial venous system also communicates with the deep veins via a number of Perforators – veins that travel directly from surface to deep. They also have valves that may become incompetent and lead to varicose veins. Incompetent Perforators are usually seen in the medial thigh, behind the knee (laterally) and medial calf and ankle.